Anime NYC is an anime convention that debuted in 2017 and returned again this fall due to last year’s success. 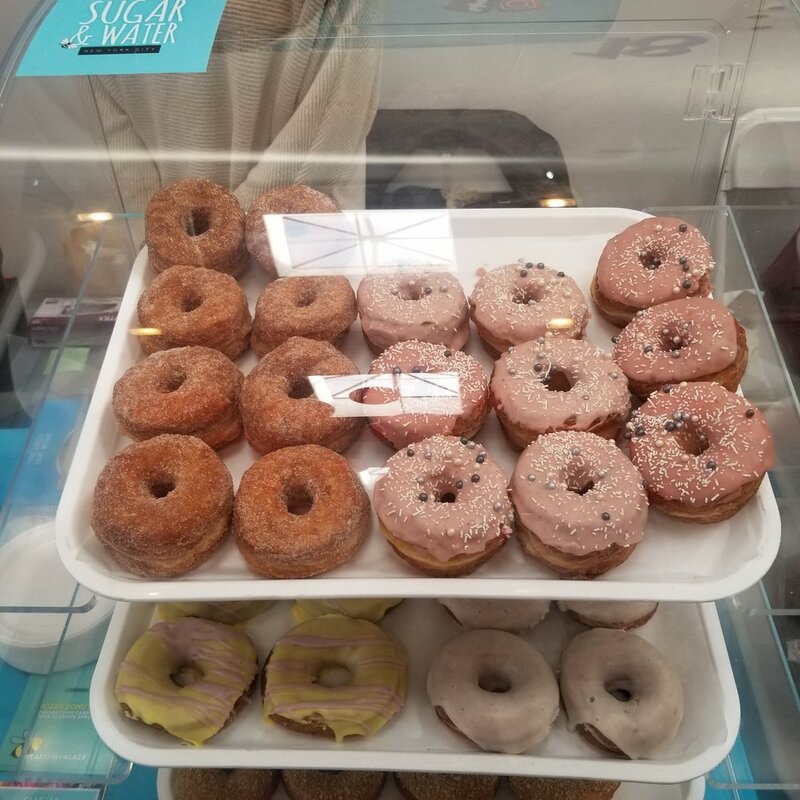 Located at the Javits Center like most of NYC’s biggest conventions, it was similar to NYCC but focused primarily on anime and Japanese culture. This year it was a 3 day weekend event running from November 16-18. I attended Saturday, the busiest of the 3 days, for a few hours to check it out. Compared to last year’s event, it has definitely grown in size and attendance, but in content, I feel like it stayed more or less the same. In Artist Alley, I saw the same artists as last year as I recognize them from the photos I took last year, which isn’t necessarily a bad thing, but it would be nice to see more talent and more varied types of artwork featured and different wares. The actual con floor had a few more vendors than last year with some new indies as well as a bigger presence with more sponsors and well known names. What I like about this con is that they don’t check tickets until you walk onto the con floor. NYCC scans your badge before you even walk into the building. So if you’re there just to cosplay and take photos, you can do so without having to pay for a ticket, which is nice for those who rarely make it onto the floor or if you only want to check out the floor for just a day but want to hang out with your friends on the other days outside the halls. This con, due to being a newer con and concentrated on a certain niche, is also a lot less crowded and congested than NYCC, so there’s plenty of room to walk around without feeling like someone is breathing down your neck or walking too uncomfortably close to you. Of course there are still lines everywhere, but they are much shorter waits. A smaller con also allows more intimate interactions with your favorite artists and vendors. They’ll have more time to interact with you, take the time to talk to you and invest in you to draw you into their booth. It doesn’t feel like a “NEXT!” culture. There were some missed opportunities however. I noticed the same food trucks there as every other convention I attended this year. For an anime con, they could’ve invested more in drawing in food trucks or food vendors more relevant to Japanese and anime culture. It’s NYC. There’s no shortage of Asian food, I’m sure. I even stumbled upon Japan Fest earlier this year walking through the streets of the East Village one day. What I didn’t like about this convention, is the same as all other pop culture conventions I’ve attended so far. There’s not a lot of exclusive merchandise to be found among the vendors on the floor. A lot of it is the same stuff I can easily find here in the states, through a simple Google search, for probably a cheaper price. So it deters me from buying anything on the floors. For an anime convention, I was hoping to find rarer wares. Clothes, toys, makeup, novelties that I could only find walking through the streets of Takeshita and Shibuya. I would be more willing to pay more for those wares. Like Secret Honey clothing or exclusive Sailor Moon Creer Beaute Miracle Romance products. All these vendors need to up their game. One of the cutest and favorite cosplays I spotted was Kotoko and Sumomo from the Chobits series, one of my favorite animes. It’s a really cute love story, easy and quick to watch and get through. I had wanted to cosplay Kotoko once upon a time but got lazy but I hate wearing wigs and it’s hard to find a person to commission what you want just right. I bumped into Vampybitme on my way out, as she was on her way out of the con. She was really sweet to me and my sisters, as my sister shyly spoke Vietnamese to her. It’s funny meeting her up close, as we’re basically the same size. I admire her for turning this into such a successful career and how she gets to partner with so many companies and travel all over the world, especially Japan. Man, I would love to be able to jet set to Japan. Alas, the West Coast Asians and their ability to take chances and invest in riskier careers! The East Coast Asian in me could never make that jump, even though my heart is a West Coast Asian in my fashion style and certain reckless natures. But maybe it would’ve been different had my parents raised me on the West Coast. We’ll never know. I attended in my casual Sailor Moon Crystal cosplay for the day and got some quick shots from my photographer friends as well. It took me a while to develop the Sailor Moon hair, from trial and error over the years and never wanting to wear a full out wig because I always felt it looked so fake and terrible. It’s really hard to find a GOOD Sailor Moon wig so I’ve always tried to incorporate my own hair with some simple clip on hair pieces. I’ve finally found my own style of how I like to look as my interpretation of Sailor Moon and I’m pretty happy with it. I didn’t do the front bangs because I didn’t want to cut my bangs just for this con. But I like how natural this looks on me as my own style. If only the moontails weren’t so easily tangled, I’d probably wear this hairstyle all the time because it’s so easy to throw together. Anyways, I’m not sure if I’ll be attending again next year since this year’s content didn’t exactly wow me. It’s still nice to check out for a day for a few hours but I would mark this convention as one you only need a day out of, not a weekend pass necessarily. If you’ve never been, it’s fun to check out and see for yourself since everyone goes for different reasons. But if you’re a seasoned con goer, this might be one and done. I didn't originally mean to attend OMG Dessert Goals til last minute, due to winning a pair of tickets literally 2 days before the event. Lately a lot of my adventures have been last minute, with invites dropping in my inbox with not enough heads up for me to plan them out, but my ambitiously forever gramming self ends up racing to do it all because some of these are such limited time events. Unfortunately I'm not a local NYC girl so it's not easy for me to get out there, which is why I limit my trips to the weekends I'm off work. A lot of people wonder how I learn about a lot.of the pop-ups and events I attend. There's no secret. I simply switched gears and started following Instagrams that feature new pop-ups and new things to do in the city. Which is how I learned about OMG Dessert Goals. I knew about it from food bloggers but not the full extent of what it entailed. I never bought a ticket to it because I didn't know what I would be getting myself into and if it would be worth it. I entered a contest run by Fomofeed and got an email Friday morning that I won tickets into their Sunday morning slot. 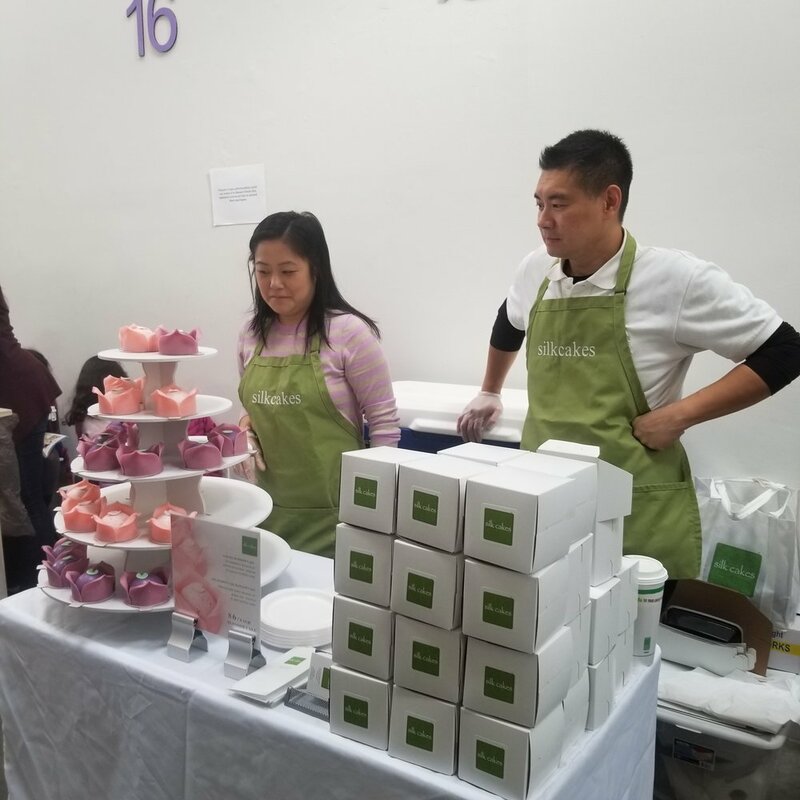 Looking at the lineup of vendors, I saw a few that were actually on my to-do list to try around the city, so I was excited to go and finally get to try these new desserts. The one con I found about the event was how to get there. It wasn't exactly easy as it was in Long Island City and a lot of trains were either down or not operating on time that weekend. It was still a walk from the nearest station as well and it was a particularly cold day out. I noticed a lot of other attendees getting dropped off by Ubers. The location was in a big warehouse alongside the river, which was sketchy at first upon entering the area. My sisters and I all thought, is this where we come to die because we greedily wanted desserts?! Is this how we go?! Hansel and Gretel style? If it was a warmer day/season, the entrance may have been decorated a little nicer and further out to invite guests in but it was cold and windy by the water so the entrance was further in and hidden from the path in which you had to walk to get there. BUT! Once inside, I am happy to report everything was fine and went well! There was a bit of a line to get in but in the waiting area there were a few cute walls and props to take photos while you waited. There was a cute photobooth with free Sparkling Ice water giveaways as well. With your admission, you get a few free things. You get free water from Boxed Water, free candy from Sugarfina (They give you a small bag that you get to fill up at the candy bar, but honestly the bag they give you could’ve been bigger but maybe I’m just greedy. It was probably that size to keep the lines moving and keep people from staying there too long but there were only 3 candies to choose from so this could’ve been done better. ), and free mochi from My/Mo Mochi ice cream. The free mochi was nice but there was only one flavor available - cookies and cream which is a generally well liked favor by the masses, but it would’ve been nice to have options to try something different. In the vendor room, it was mayhem! But beautiful. There were so many people and so many beautiful desserts. There were lines everywhere. I scouted the room first to plan my attack. I ended up trying quite a bit. 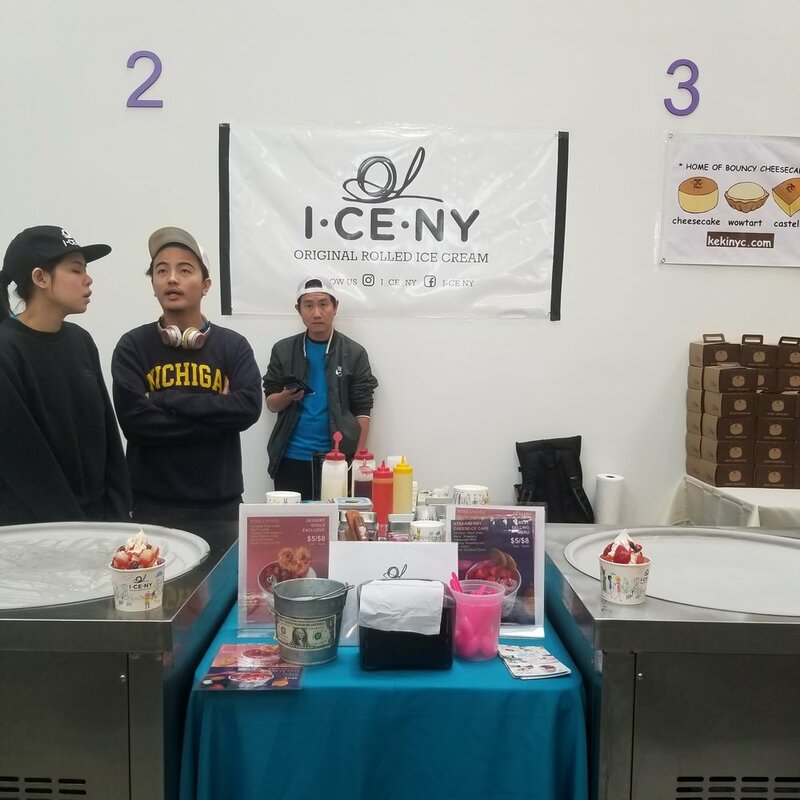 ICE NY - They had a special rose lychee rolled ice cream special just for this event and it was delicious. I love anything rose and lychee flavored and it was totally grammable. Rebecca’s Cake Pops - These were the most adorable, cutest Instagrammable treat of the whole place! 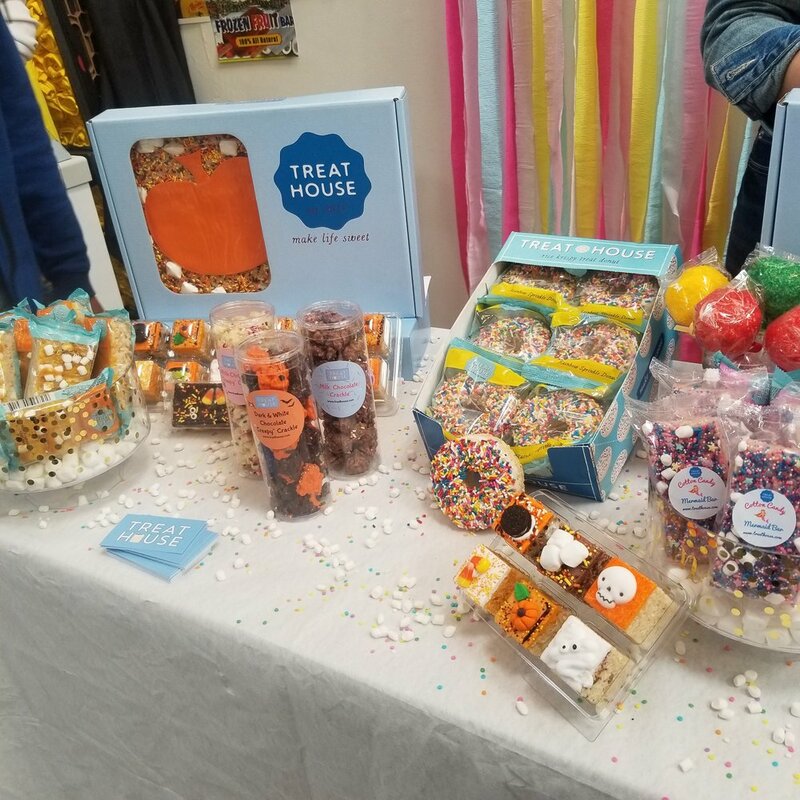 This booth easily had the longest line and you could tell it was a mom and pop run shop, with the parents taking orders as their children helped put together cute boxes for the treats to be packaged in. Regardless of the long line, they took their time and made sure every order was perfect and to your liking. 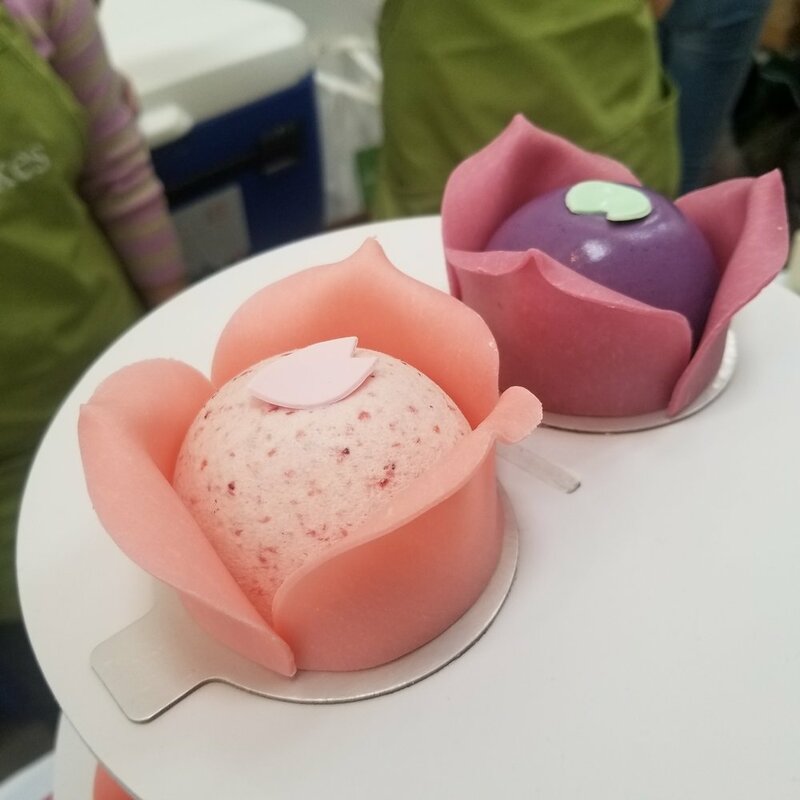 Silk Cakes - I’ve seen these for a while now but the bakery is out of the way for me in Queens and I really hate going anywhere in Queens, honestly so I haven’t had a chance to try them so I was really excited they were a vendor here. Their cakes looked so perfect in real life and tasted so soft and mousse/cream-like. I hope they come to the next event! The Stackery - This was a new dessert I’ve never seen or heard of. At first I thought the cone was made of a sweet pastry-like dough but it was actually bread! It was a nice touch to the ice cream because it complemented the sweetness instead adding to it and making it too overly sweet. The vendors working the booth were absolutely sweet to us while putting together our order. Treat House - These were cute rice krispie treats decorated in the Halloween spirit. 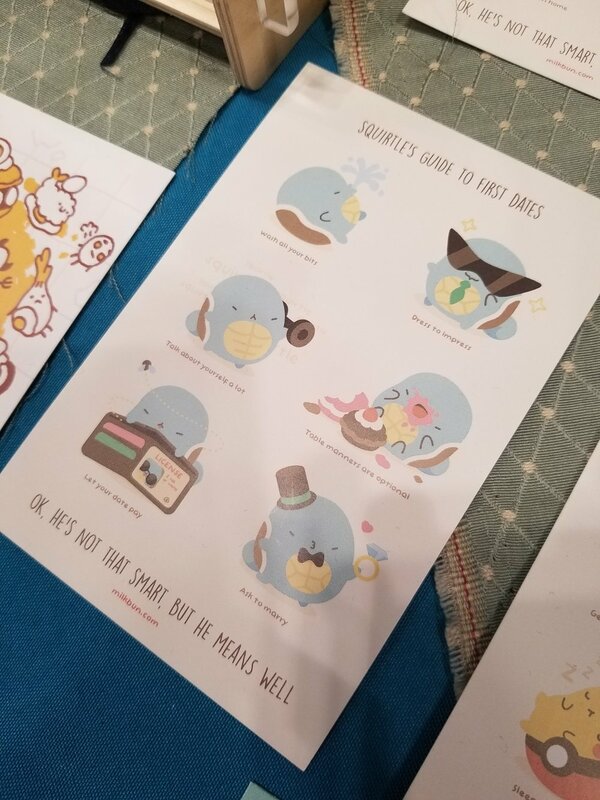 They were just too adorable and my sister bought a box of 6 of these to take home. Sugar & Water - I’ve seen their pretty glittery croissant donuts all over the gram. Another vendor I wanted to try but again, in Queens so it hindered me from visiting. Their pink dossant was as delicious as it was pretty. Kochin Desserts - Another brand new dessert I saw and was intrigued by so we obviously had to try. Flan, coffee ice cream, banana brulee, and coffee jelly, served with a Vietnamese espresso shot. It was quite a mix! I love desserts where there’s a little bit of everything. This was served in the cutest coconut shell too. 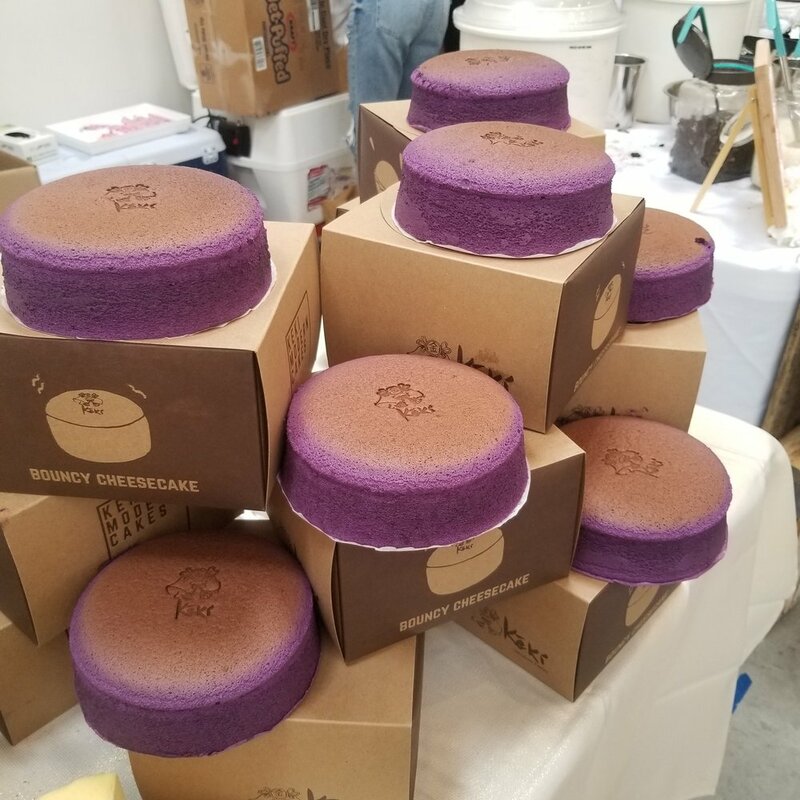 Keki Modern Cakes - I’ve seen these all over but honestly I’d have to say this was a disappointment. They were selling by the slices so they didn’t jiggle as much as a full cake. Hype was gone. 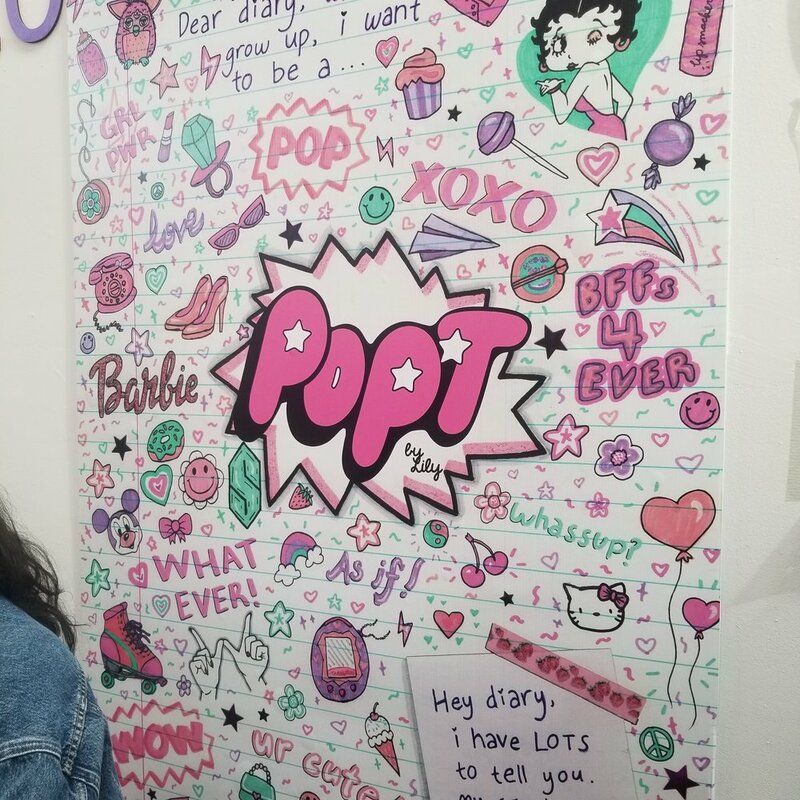 Besides the booths, the event also had a few cute stations for your gramming needs. 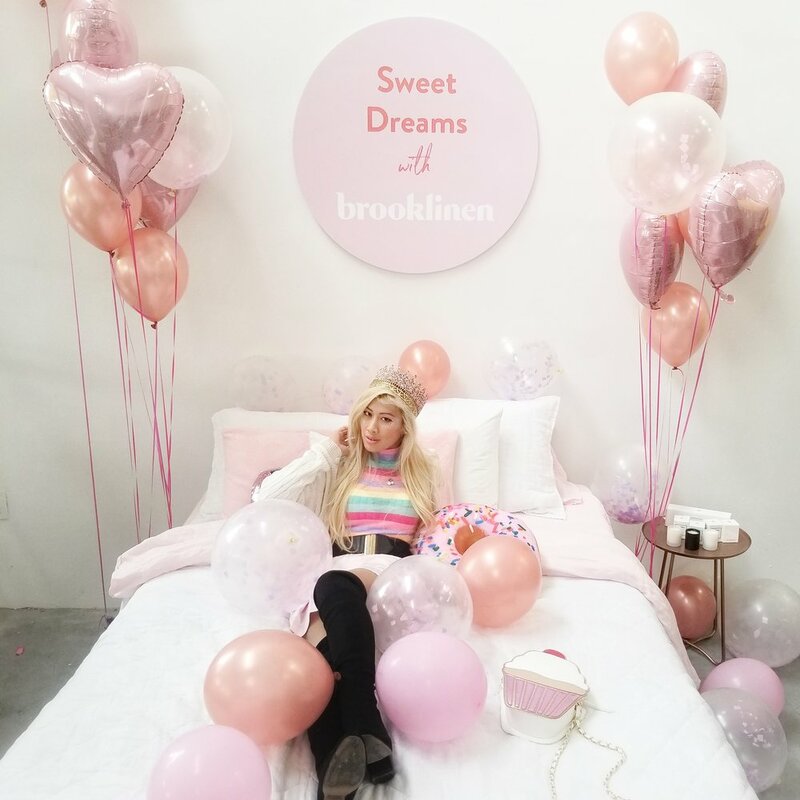 There was a bed, a cute pink room set up, and a balloon backdrop on the inside of the warehouse. Outside the event, towards the exit, were a few Instagrammable walls to serve as small backdrops for your dessert as well. I didn’t get to take photos of these as our time slot was coming to a close. Being my first time, I didn’t know to use my time more wisely to be able to gram it all. BUT, now I know for next time. Next to these walls, they also had a salt bar to help cleanse your palate in between desserts, with free snacks like pretzels, popcorn, and cheese balls. 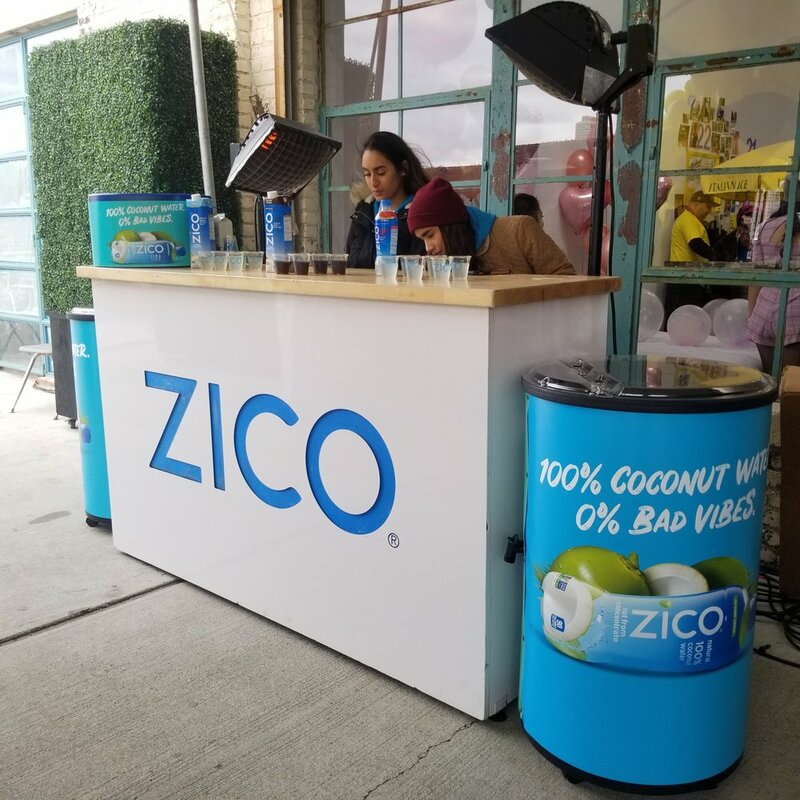 There was also a Zico bar with free samples of different flavors of coconut water. All in all, I actually enjoyed this event a lot! I look forward to returning for the spring edition if they continue. 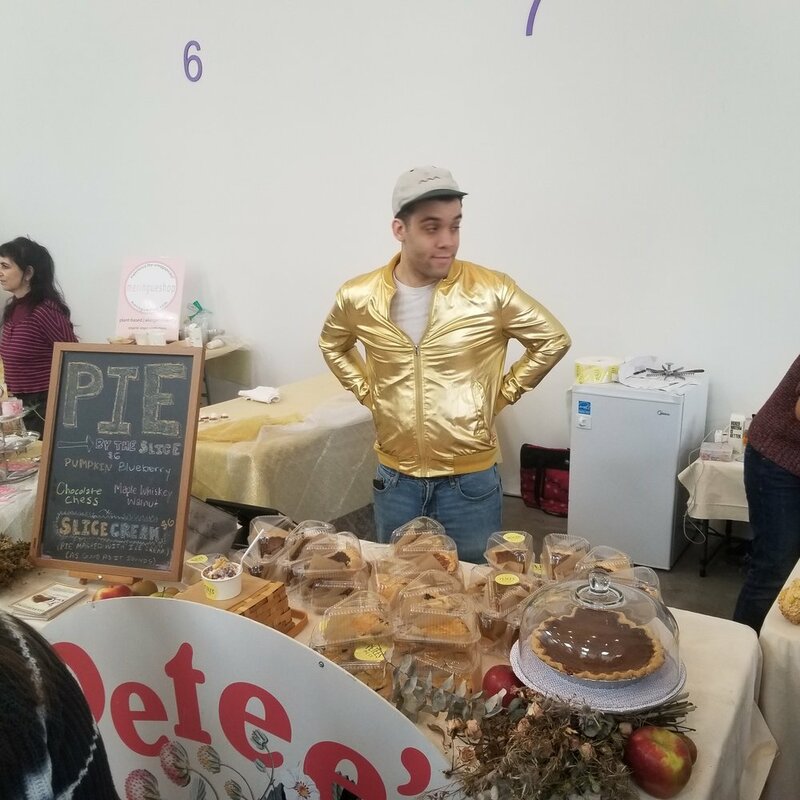 When I go to comic conventions I’m always complaining about the lack of food vendors, the lack of variety and lack of cuteness. In reality, I just want to go to a food con. Like a big Costco where I go from booth to booth sampling food. This was pretty much that for desserts. I had a great time trying many different types of desserts and trying new things. The event was well put together, well organized and well executed. You can tell they put a lot of work into it with the decorations, backdrops and even thought of the Instagrammers. I would definitely recommend this if you’re a foodie as well as a #forthegram foodie. It’s worth the price of admission and worth your time.